The Georgetown Divide Equestrian Trails Foundation (GDETF) was originally started in 1987 as the El Dorado Equestrian Trails Foundation for the purpose of supporting equestrian and hiking trails on the Georgetown Divide. The name was changed in 2014 to provide a clearer identity for the organization. Over the years, GDETF has identified and marked many of the old trails in the area, and has been instrumental in helping build and maintain both new and old trails. The organization grew out of the volunteer efforts of Bonnie and Dave McLane, Bill Pieper, and others in the early 1980s. Even before EDETF was incorporated 1987 as a 501(c)(3) non-profit, the McLanes had created a trail from the Meadowbrook staging area to the Balderston corrals near Camp Virner, which is known as the Mar Det Trail. The Mar Det Trail gets its name from the group that helped build it: a Marine Detachment from the USS Carl Vinson. For more than ten years during the 1980s and early 1990s, the McLanes sponsored the 50 mile Dru Barner Endurance Ride on this trail. In 1995, with contributions from the former Dru Barner Foundation and the U.S. Forest Service, GDETF undertook the development and construction of the Dru Barner Campground. 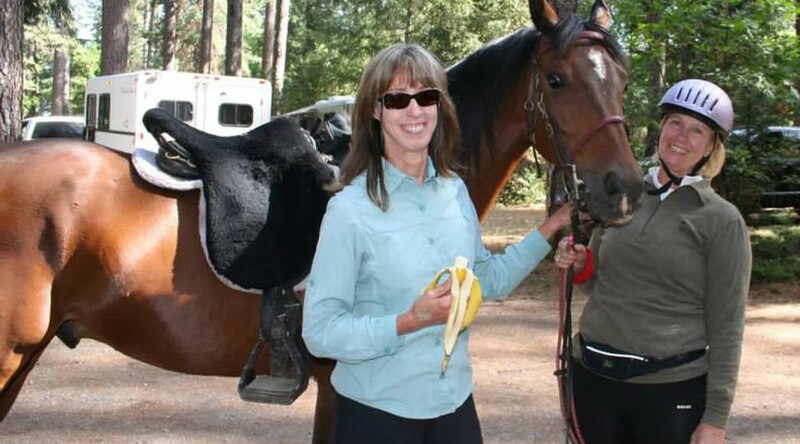 This joint effort, with additional contributions from the Robie Foundation, Silver Spurs Riding Club, Gold Country Endurance Riders, and equestrians throughout our area, resulted in to what is now one of the finest equestrian campgrounds in Northern California with access to hundreds of miles of trails. Over the past 15 years the campground has continued to be improved with the dedication of the Forest Service and financial and volunteer contributions of GDETF and its members. In 2009 and 2010, GDETF volunteers, with $5,000 from GDETF and another $5,000 from the Dru Barner Foundation, made improvements to the Balderston Station area, Dru Barner Campground, and the Meadowbrook Staging area. These improvements included new signage, new picnic tables, gravel for the roads, and expanded parking , the hiring of CCC (California Conservation Corps) clearing of brush on the trails, plus improvements to the group barbecue area. The Forest Service also upgraded the water system for the campground. With another $3,000 GDETF purchased and installed the first pipe horse corrals; with the goal to ultimately provide pipe corrals for most campsites. The campground now includes 48 equestrian campsites, picnic tables with fire rings, water for people and horses, multiple restrooms, and a group barbecue area as well as the horse corrals. In 2014, GDETF again made a significant capital outlay for additional picnic tables, fire rings, and one additional double corral. The Balderston Corral staging area also underwent significant rejuvenation toward the end of 2014. GDETF has also been instrumental in building or funding improvements at other horse equestrian facilities in El Dorado County. For example, in 2006, with $6,000 and hundreds of volunteer hours, the Donaldson Park Staging area in Volcanoville was improved to include a paved parking area for rigs and a picnic area plus a permanent restroom facility. GDETF continues to work with the Forest Service to develop a connecting trail between the Donaldson Trailhead and the Dru Barner Campground. In 2007, GDETF contributed $2,500 toward completing the asphalt apron at the then new Magnolia staging area along State Hwy 49 across from the Hart 2 Hart Winery. GDETF has also contributed to the facilities at the Cool (Knickerbocker) staging area, plus helping purchase the final parcel of the American River Trail, contributing $5,000 toward the construction of a new staging area near the Salmon Falls Bridge which will connect trails from Cronin to Folsom Lake. In 1999, a “Fun” Ride on Memorial Day weekend replaced the Endurance Ride that previously took place that weekend, and continues to this day. Riders can choose to do a 5 mile, 12 mile or 25 mile loop ride on well-marked trails, ending with a BBQ and raffle at Dru Barner Park. This is our major fund raiser and has been highly successful, drawing riders from all over Northern California and beyond. GDETF has also sponsored trail clinics, campouts, Poker rides, and other activities as well as helping each year with events put on by other organizations such as the Gold Country Endurance Ride, the North American Trail Ride Conference (NATRC) Region 1 Georgetown ride, and the annual 100-Mile Western States Ride (Tevis) where GDETF volunteers run the Mount Quarry Vet Check. GDETF’s mission will continue to be to identify and preserve the historic trails of the Georgetown Divide, and to provide opportunities to experience the incredible beauty of our area whether on foot or from the back of a horse. We work closely with the Georgetown Divide Recreation District as a community partner, with the Divide Horsemen’s Association, Gold Country Endurance Riders, and other groups for the benefit of our trails. GDETF dues are nominal to encourage hikers, walkers, equestrians, families and folks to contribute to keeping our trails open. Our focus is to enjoy the out-of-doors of The Divide, and to be a part of preserving our way of life for future generations. GDETF is a 501(c)(3) non-profit corporation. Our general meetings are always open to all members and non-members wishing to attend. If you own a horse, ride the trails or enjoy walking and hiking, we need your support and urge you to join GDETF. For more information about the Dru Barner Equestrian Campground, contact the U.S. Forest Service, Georgetown Ranger District, at (530) 333-4312. Or, use the CONTACT button to contact GDETF.